mTOR is a component of two major intracellular signaling complexes: mTORC1 and mTORC2. These complexes contain two different scaffolding proteins (raptor and rictor, respectively) that “connect” them to different downstream targets. As a result, these complexes have different functional roles. mTORC1 stimulates cell growth and proliferation, whereas mTORC2 regulates cell polarity and the cytoskeleton. mTORC1 is activated by growth factors and amino acids, which activate PI3K, a lipid kinase. PI3K then phosphorylates PIP2 to yield PIP3. PIP3 phosphorylates and activates Akt through an intermediary kinase, 3-phosphoinositide-dependent kinase-1 (PDK1). The activity of PI3K is negatively regulated by PTEN, a phosphatase that dephosphorylates PIP3 back to PIP2. Once activated, Akt phosphorylates and inhibits the TSC. TSC negatively regulates mTORC1 by inhibiting Rheb, a small cytoplasmic GTPase and activator of mTORC1. AMPK, which is activated by any form of cell stress that decreases cell ATP stores and increases the AMP-ATP ratio, inhibits mTOR by phosphorylating and activating TSC2. Akt is also phosphorylated by mTORC2, although phosphorylation of Akt by mTORC2 is not necessary for the activation mTORC1. Once activated, mTORC1 phosphorylates p70S6K and 4EBP, leading to the translation of mRNAs and the synthesis of proteins necessary for cell growth and cell-cycle progression. The upstream modulators of mTORC2 are as yet unknown. Hyperglycemia stimulates mTOR. mTOR is activated within the kidney in DN. 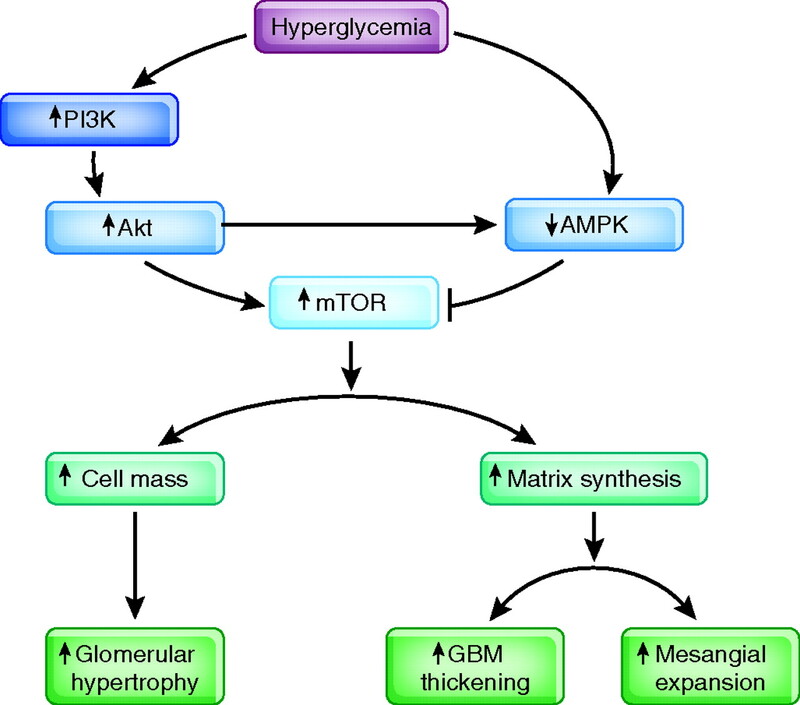 Hyperglycemia activates PI3K and Akt and inhibits AMPK. 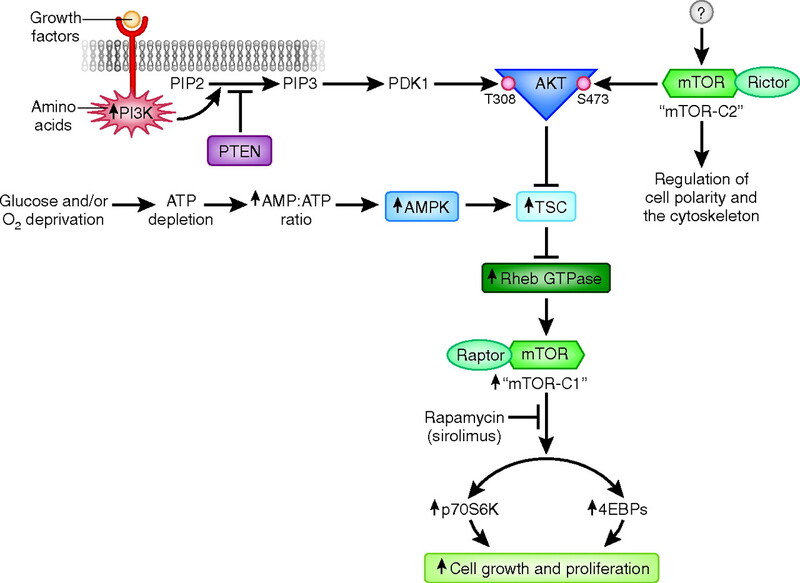 The activation of Akt and inhibition of AMPK lead to activation of mTORC1. Activation of mTORC1 contributes to the renal changes characteristic of DN, including glomerular hypertrophy, glomerular basement membrane (GBM) thickening, and the accumulation of mesangial matrix. Activation of mTORC1 in CKD plays a major role in mediating the glomerular hypertrophy associated with the loss of functioning nephrons in CKD. The increased intracapillary pressures and flows associated with adaptive glomerular hypertrophy ultimately lead to podocyte injury and proteinuria. Increased mTORC1 activity in CKD also promotes interstitial inflammation by promoting the proliferation of lymphocytes and interstitial fibroblasts. Fibroblasts produce the connective tissue necessary for interstitial fibrosis. mTORC1 activation also leads indirectly to the release of proinflammatory and profibrotic cytokines, which are derived from multiple sources, including tubular cells (activated by proteinuria), inflammatory cells, and fibroblasts. These cytokines result in a positive-feedback loop that increases inflammation and fibrosis. Some cytokines are also necessary for EMT, which further promotes interstitial fibrosis. Injury to tubules caused by inflammatory cells promotes tubular injury, atrophy, and “dropout.” In addition, the deposition of fibrous tissue within the renal interstitium reduces local blood flow, causing areas of hypoxia that lead to further loss of functioning nephrons. An increase in the constitutive activity of mTORC1 promotes the growth and invasiveness of many aggressive tumors, including metastatic RCC. This is due to several mechanisms. First, increased activity of mTORC1 promotes cell growth and proliferation. In addition, mTORC1 increases the cellular levels of HIF-1α, which in turn stimulates the production of proangiogenic factors such as VEGF, PDGF-α, and TNF-α. Increased angiogenesis is necessary to meet the increasing oxygen requirements of growing tumors. In some patients with RCC, activation of mTORC1 is mediated by loss-of-function mutations of the phosphatase PTEN, which negatively regulates mTORC1 through the upstream PI3K/Akt pathway. Also, patients with tuberous sclerosis are predisposed to the development of RCC because of loss-of-function mutations of the TSC, which interferes with the negative regulation of mTORC1 activity by TSC.